Not Your Grandfather’s Hand Pump! 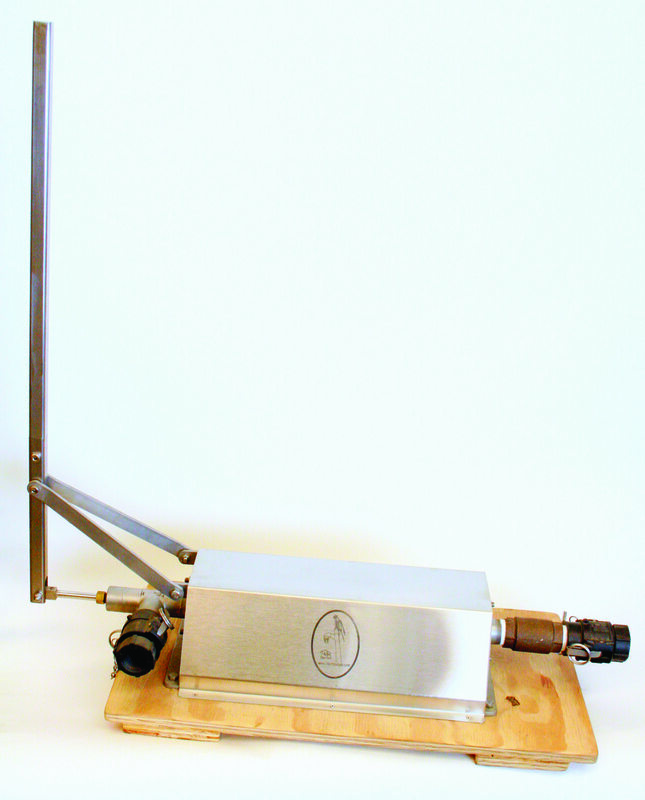 Home|Blog|Uncategorized|Not Your Grandfather’s Hand Pump! Many of our customers choose to build their log homes in rural areas with private water and septic systems. Typically wells are dug or drilled and an electric well pump is installed to move the water to the house and pressurize the system. However, rural residents should also plan for the likelihood of power outages due to storms, floods or other emergencies. 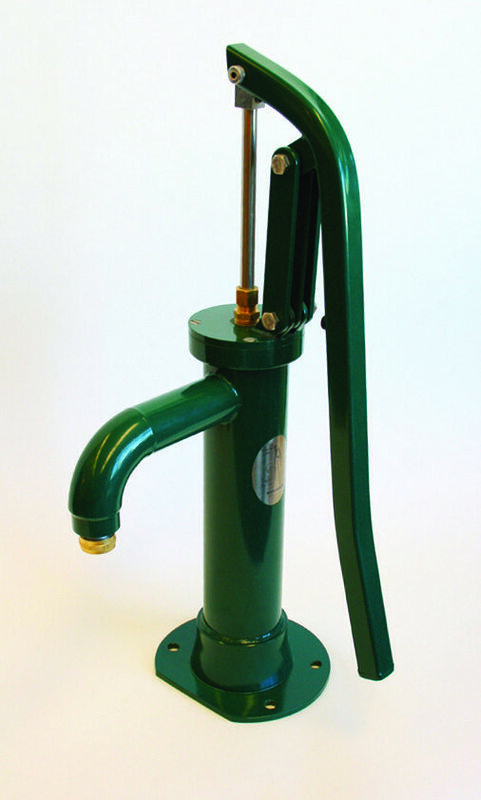 As we’ve written about previously, Bison Hand Pumps give you access to your water, as well as protecting your water source from contamination from flooding. Bison Pumps can be installed alongside electric pumps in the well casing for effortless access to water anytime the power goes out. The classic stainless steel design of the original pump can be enhanced with handle options, and powder coated interior countertop models are available in red or green. Each pump has a threaded spout to allow the attachment of a common garden hose. When the hose is attached to an exterior convenience spigot, the Bison hand pump can transfer water from your well to your domestic water system for emergency use. Bison also offers models for unique situations. For camps or intermittent-use wells, Bison offers a quick-disconnect model, which allows easy transport to other well sites or protection for a seasonal well. Indoor pump installations can be achieved with either a shallow well pump kit or the new one-piece “pump in a box” that is simple to install on kitchen or washroom countertops. For other rural and agricultural applications, Bison has developed a transfer pump (right), a portable unit that you can employ to pump water from a pond or cistern into a watering tank or fertilizer spray unit. If you’re in a water-conscious area and are collecting rainwater for gardening, a Bison Pump can provide easy access to your rainwater collection system. 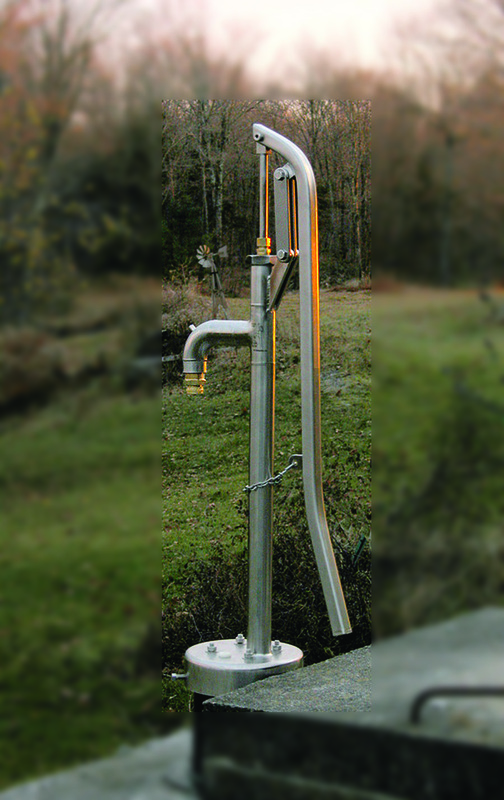 The pumps are designed for effortless pump action and can work for wells with static water levels as deep as 250 feet. 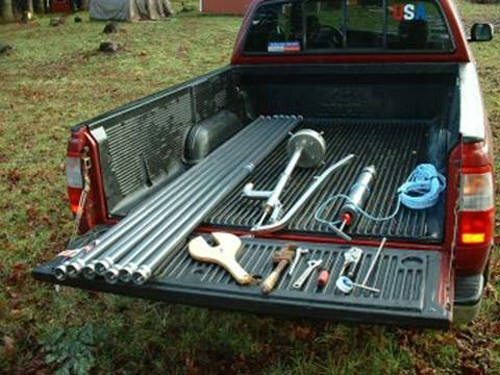 Each pump is sold with a complete kit of parts for assembly and simple installation (below). Most customers who are handy around the home can install the pump with the assistance of a helper, using Bison’s user-friendly instructions. For more information about the pump design that might make sense for your log home or camp, contact Bison Hand Water Pumps at 800-339-2601 or click here to visit their website.